Disclosure: I received the filing cabinet and pair of chairs from Staples for review. All opinions are my own. When I first got married, the 2nd bedroom was a home office/guest room which was nice because it was spacious. 8 years and 2 kids later, the office is now a nook on the 3rd floor. It's a relatively small space that became cluttered with files and knick knacks. Since I didn't have room for the huge executive chair, I resorted to using a small stool from Kenzie's table. It was time for a spring cleaning! I like to think that I am pretty organized but once you add all the important things for two children, it becomes a bit overwhelming. My plastic file bucket broke during the move yet I kept shoving things into it without actually putting them into the file folders because I became lazy. In line with Spring, the pastel hanging file folders gave me the motivation to tackle the paper. From my tiny little plastic box, I threw out 2 bags of paperwork and manuals that were no longer necessary. It only took a few minutes to label the tabs which makes finding something really easy. These fit perfectly into the Poppin File Cabinet ($199.99) from Staples. I love the contrast of black drawers against the white cabinet. It looks chic and the round corners make it safe for my kids who were inquisitive and wanted to dig around in it. From first look, it seems to be compact however once you start filling it up, it is very spacious (16” x 20” x 24”). 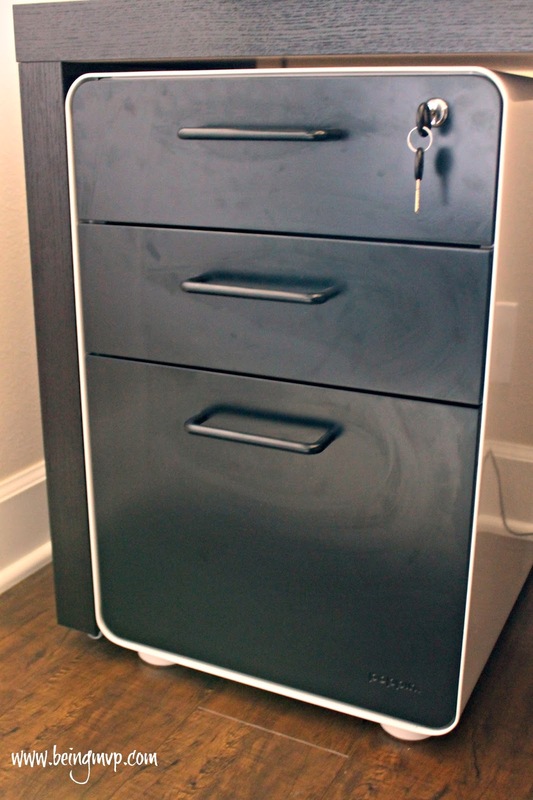 There are 3 drawers that can easily fit file folders, craft supplies, important documents, office accessories and more. You can even lock the cabinet if you want to secure the contents. What's neat about this file cabinet is that it seamlessly slides underneath our desk therefore maximizing the office space. 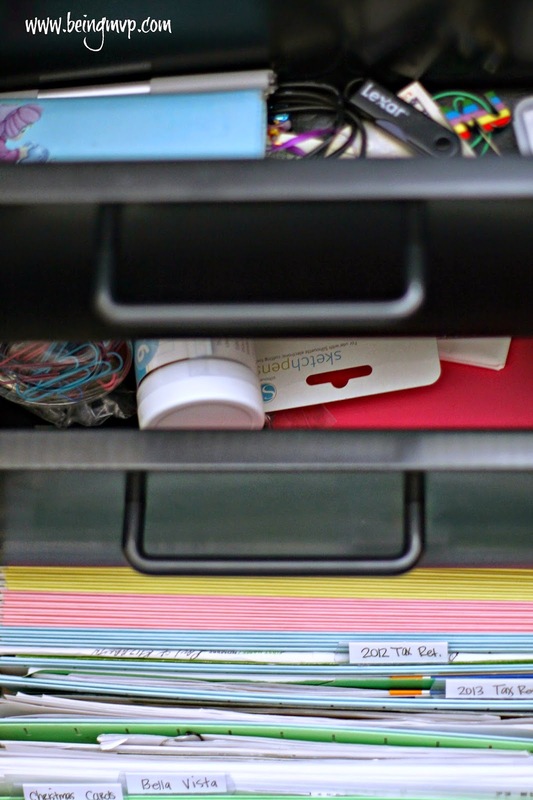 Keeping important files organized is definitely important so you don't have to dig through a pile of dusty paperwork (like my Hubs when he was looking for the title to his car just the other weekend!). After using my Poppin cabinet, I decided to revamp my desk at work with some new accessories since they order from Staples exclusively. However, since we order from a specific catalog that didn't include Poppin products, I have smoke acrylic desk accessories which are also awesome. Since my Poppin fix wasn't complete, I popped on over to my local Staples store and picked up a few Poppin office supplies thanks to Hubs. The pieces are really affordable and you can keep it monotone with your favorite color or go all out and feature the rainbow hue. How amazing is my gold poppin notebook? I am definitely headed back soon to stock up on more fun Poppin items because they make the top of your desk feel zen and decluttered. 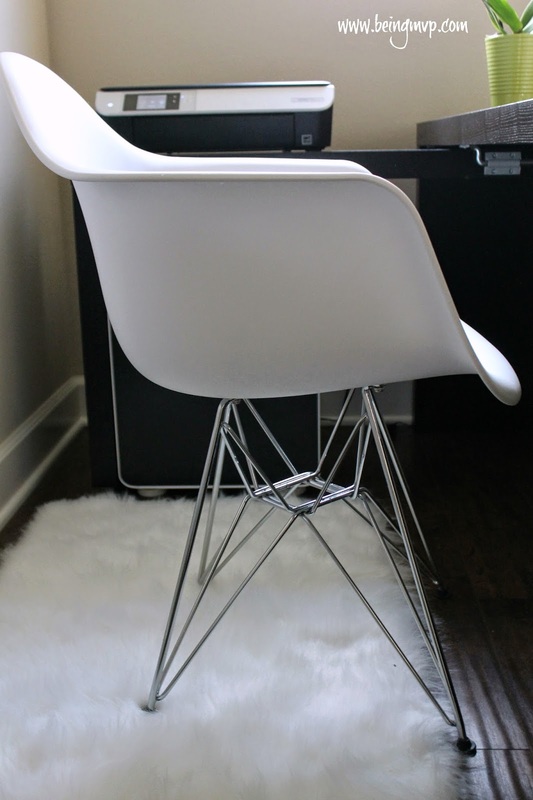 We have always purchased the executive leather office chairs from Staples but since our new office space was tight and I didn't want to accidentally roll down the stairs when lounging, I wanted something different and fresh. Who knew that Staples carried such a variety of accent chairs that were modern and unique? We mostly shop in store and purchase on impulse and I never thought of using an accent chair for the office. I am converted after sitting in the Baxton Studio Dario Chair ($230.99/set of 2). I've seen similar chairs pop up all over my Instagram and Pinterest feeds. I just had to attach the legs and Kenzie couldn't wait to sit on it. She did claim one as her chair in the living room. The plastic is durable and the steel base makes it study. I can easily curl up on this while I work or sit straight with back support. This is a much needed relief after slumping over Kenzie's stool for over a year. Don't get scared about straying from the usual office chair. Make sure to Connect with Staples on Facebook and Twitter. What do you think of my space? 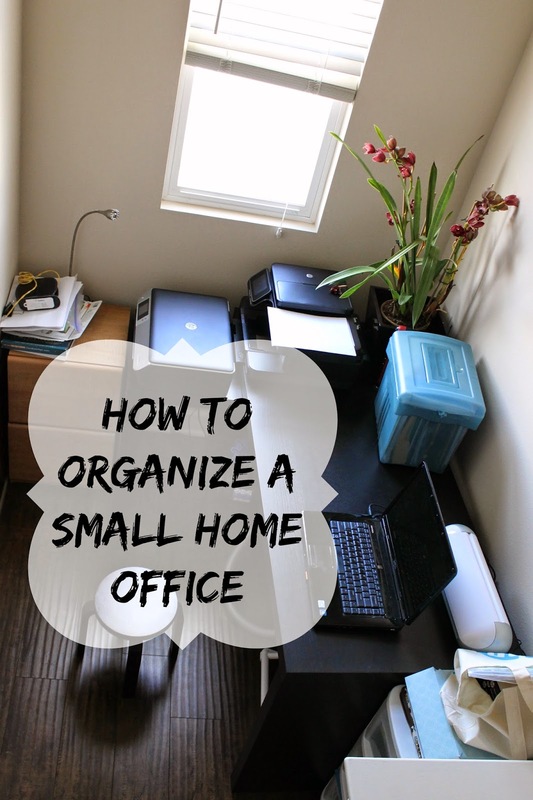 Are you organizing your home office for spring? What items do you want from Staples to help? I need to straighten up my space bad! My desk is in my living room and it's a cluttered mess! Need to toss a bunch of junk. I love the way you spruced up your office space! You found some great stuff at Staples. I haven't been to Staples in a while, but I should check it out. I didn't realize they had fun but functional things like this! I love it. It's so crisp and modern looking. I am loving that chair by the way!! Your space looks great and so compact! My husband keeps his office in my craft room so I often over take his larger space,. I need to use some of your ideas to gain my space in my craft room without sacrificing what he actually needs in the office. What a cute space and great tips!! I am gonna use these in my office for sure! You have wonderful organization skills! I love how you were able to organize your small space. That rug is to die for! That looks really amazing. I need to do the same in my office. I am ashamed to say its beginning to look like a catch all :( Great tips. Thank you! 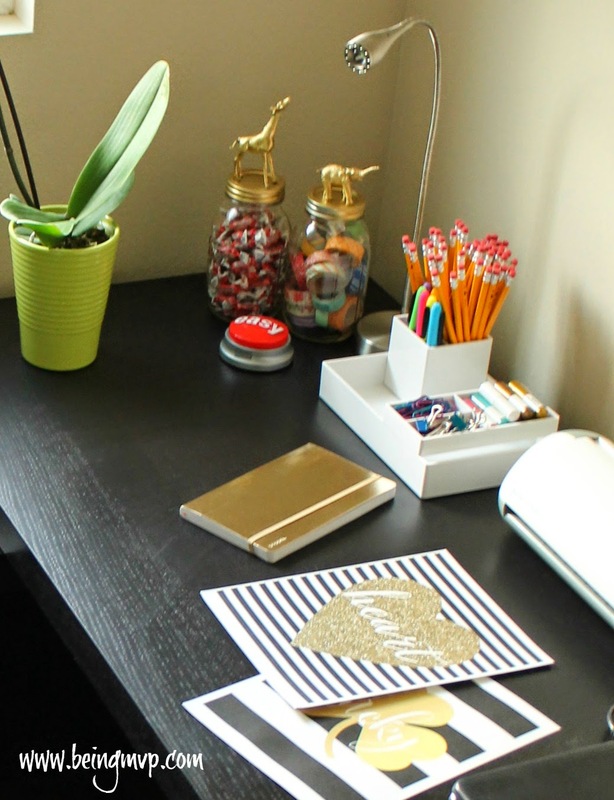 Even though it's small your office is absolutely gorgeous and it looks so organized! I'm in need of some of those organizational tools-my office is ALL over the place. I wish I had space for a home office! Great tips! I love how modern your office is! All the furniture really makes it sleek, which is an achievement considering how small it is! That chair is pretty darn awesome! The space is really fresh and inviting now! Love these tips! I am moving this summer and will be setting up a new office. Thank you for sharing. very modern and very hip furniture, love the filing cabinet. Looks great! I need some major help over here. I seem to just clutter up everything!! Wow! Your office space looks great. Staples has a lot of really great products. That chair looks so comfy! 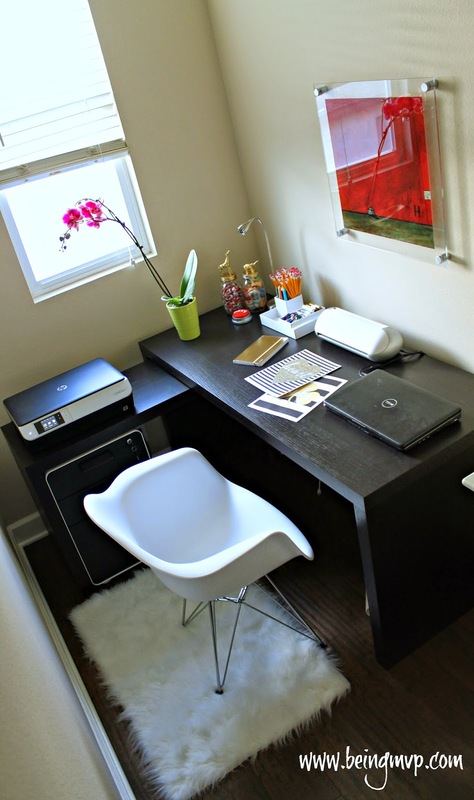 Small spaces are hard to decorate but you did your office beautifully. I love how it has a look all of its own and is so organized - great chair too! What a cute office! You made a lot happen with a little bit of space! I have an office in my house but it doesn't get to look like that! I wish. Love these pieces and all Staples has to offer!! Your office looks so organized. My little office is....scary. I need to follow some of the tips lol. What a cute office. I love the chair, I'm in the middle of organizing my office. This helps!